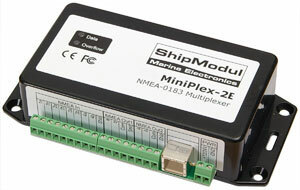 The MiniPlex-3E is an advanced NMEA multiplexer, combining data from up to four navigation instruments into two NMEA outputs and an RS–232 port. It also supports AIS and other high speed NMEA devices up to 57600 Baud. Data from multiple instruments is available as one single stream on the Ethernet network. This reduces wiring cost and the data is available to any device or computer on the network. Supports TCP/IP for a point-to-point connection and UDP Broadcast to communicate simultaneously with all computers and devices on the network. All computers and devices can send data to the MiniPlex−2E. Full galvanic isolation on the Ethernet port, eliminating ground loops between multiplexer and network. 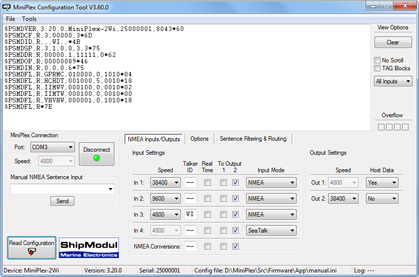 The firmware inside the MiniPlex−3E can be updated over the network. This can also be done remotely over the Internet. Updated firmware files are available on the Download page. The MiniPlex-3E has a rich set of features and configuration options, enabling the user to tackle almost any NMEA bottleneck or interface problem. The supplied Windows utility MPX-Config allows full configuration of the multiplexer and monitoring of NMEA data passing through the multiplexer. Network data can be routed to any NMEA output, to be merged with other NMEA data or to override this data. This enables automatic switching between computer based navigation and GPS/instrument based navigation. Flexible communication speed The communication speed of all inputs and outputs can be set from 4800 to 57600 Baud to allow connection of devices that operate at non-standard (4800 Baud) communication speeds like integrated weather sensors, gyrocompasses orAIS equipment. Priority With Priority enabled, similar NMEA sentences on different inputs are only passed from the input with the highest priority. The Ethernet port has the highest priority, followed by inputs 1 to 4, in descending order. When for instance two GPS receivers are connected to inputs 1 and 2, and both transmit the same type of NMEA sentences, only those received on input 1 are passed. An adjustable time-out ensures that similar sentences from the GPS at input 2 are passed when the GPS at input 1 stops sending these sentences. Optionally, GPS sentences are checked for a valid status field, causing automatic switchover when the primary GPS looses satellite signal. A manual can be downloaded.